This post was originally published on socialsim. I developed this 2×2 to make a point about new and old media for a presentation at Futuresonic08 about the future of media engagement. Your comments are greatly appreciated. The top right cluster is a relative positioning of the major players in the virtual community landscape. You can exchange the word ‘participation’ for ‘engagement’, and then it becomes a more powerful piece. The bottom left demonstrates a point – traditional media is static and observational. 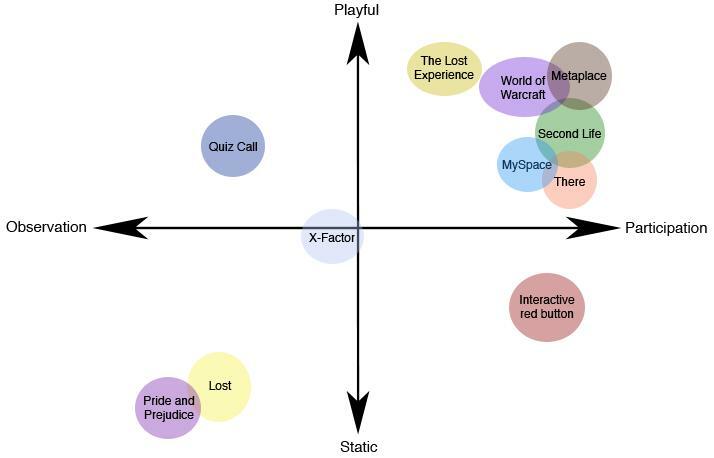 Yet The Lost Experience is in the top right, riffing off Lost in the bottom left. There are ways of bringing static media into the new media spectrum. To wit, last night at his book reading during the Brighton Festival, I asked Hanif Kureshi whether he’d thought about engaging with non-linear storytelling using new media. His response was that he’d only be interested in engaging with interactive forms of storytelling if the people who were contributing back were ‘good’. I was disappointed. This is from a man who’s written for the page and both the small and big screens, yet interactive and non-linear storytelling wasn’t on his radar at all. And his response misses the point completely. Please do contribute your thoughts to the 2×2 above. It would be great to flesh it out.